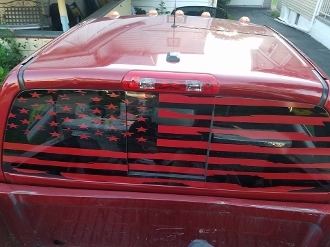 DODGE RAM REAR WINDOW DISTRESSED AMERICAN FLAG DECAL. THIS WILL FIT SOLID WINDOW OR WINDOW WITH SLIDER. DECAL IS OF HIGH QUALITY VINYL. CHOOSE COLOR. WE SUGGEST TO INSTALL THIS IF YOU HAVE EXPERIENCE WITH LARGE DECAL INSTALLATION, IF YOU DO NOT, HAVE A PROFESSIONAL DO IT. IT TOOK US TO DO THIS INSTALL AROUND 45 MINUTES.